Indexed in: Chemical Abstracts, Scopus, EBSCO. Carmen Silvia Passos Lima, Gustavo Jacob Lourenco and Jose Augusto Rinck Jr. It is indeed my great pleasure to prologue the making of the monogram "Angiogenesis and Therapeutic Targets in Cancer" organized and edited by Professor Malay Chatterjee. 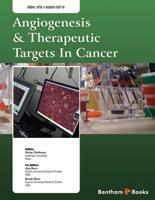 This book encompasses many important areas in the therapy of cancer by targeting various parameters of the angiogenesis process, such as angiogenesis inhibitors, dietary agents that affect angiogenesis, molecular markers for therapy, microenvironment, receptor tyrosine kinases, and signal transduction pathways; of the breast, gastric, lung, prostate, renal cancers as well as Schwannoma and multiple myeloma. I look forward to a stimulating monogram and a successful press. I hold in true and wish therefore to share in this monogram my personal principle that "for tumor progression and cancer metastasis are not random - treatments and cure is logical and eventual". Paget S. The distribution of secondary growths in cancer of the breast. Lancet 1:571-573, 1889. Fidler I. J. The pathogenesis of cancer metastasis: the 'seed and soil' hypothesis revisited (Timeline). Nat. Rev. Cancer 3:3453-3458, 2003. Folkman J. Tumor angiogenesis: therapeutic implications. N. Engl. J. Med. 285:1182-1186. 1971. A variety of cancers are known to originate in epithelial structures and require stromal support to become invasive. This dual mechanism is applicable to nearly all types of cancer. Further growth needs neoangiogenesis, a tumor dependent proliferation of vascular vessels to overcome hypoxia and subsequent growth stop. Metastasis, a common feature of cancer, needs stromal factors and neoangiogenesis as well. Continuous interplay between cancer cells and stroma is a prerequisite for invasion and expansion. Elucidation of neoangiogenic pathways may lead to therapeutic measures; those that convert a progressing cancer into chronic disease, offering a reasonable alternative when cure with classical drugs becomes remote. Other diseases can be approached similarly, including age-related macular degeneration and even therapeutic angiogenesis to treat ischemic disorders. When transformed cells escape control, a large number of metabolic steps need to be taken before effective cancerous growth can be expected. Among these is protection against immunological resistance, hypoxia, local inhibiting growth factors etc. Angiogenesis is another dynamic feature of invading cancer. The formation of new blood vessels is a complex, multi-step process, where endothelial cells play a pivotal role. The role of angiogenesis in renal cell cancer has been tremendously explored because contemporary treatments fail to provide efficient tumor control. Systemic cytokine therapy is rather disappointing but remains nevertheless standard of care, so far. New research points to angiogenesis and novel types of protein kinase pathways that regulate cell growth, proliferation, motility, survival and transcription. Clinical assessment of these local phenomena is a matter of passionate research that needs adequate tools and standardization. Prostate cancer continues to be a challenge for oncologists. Controversy about the initial approach and treatment of hormone resistant cancers lead to attempts to novel targeted therapies. Special emphasis is given to the role of specific tumor-associated antigens and related therapeutic targets. Special attention is going to tumor growth factor beta signaling as treatment target in advanced disease. Multiple myeloma has become a treatable disease for a number of years now. The bone marrow microenvironment is considered the best target; even from early stages. A wide variety of new compounds target this area. New minimal invasive tools provide opportunities to study surrogate markers that will shorten the investigational period and individualize therapies for tailoring patient's needs. One of the first applications of anti-angiogenic treatments was colorectal cancer because this entity expresses elevated levels of vascular endothelial growth factor. Recent attention has been given to hepatocellular cancer. Downstream pathways of the vascular endothelial growth factor receptor are in the focus of contemporary research. Gastric cancer remains another therapeutic challenge, in particular for advanced stages. Molecular targeting agents, like those aiming at the angiogenic cascade, show promise. Lung cancer, the most lethal cancer world-wide, cannot escape research on pro-angiogenic signaling. Although gene therapy with viral vectors continues to be promising, anti-angiogenic factors can provide a valuable addition to cytotoxic and local therapies. Drug development is a multi-step process that includes basic research, patent validation, extensive and long-lasting clinical trials, registration, reimbursement and commercialization before the patent protection ends. In some instances and countries, commercialization even fails to start before patents close on protection. Drug development is not only extremely expensive but also risky. Hence the need for shortening the developmental process and a way to achieve this is the search for surrogate markers of anti-angiogenic processes and therapy outcome. One of the most obvious options is non-invasive imaging and minimal invasive tools, detection of circulating angiogenic substances and activated endothelial cells to be considered. A critical assessment of these surrogate markers and how they can be retrieved is an essential part of drug development. A plethora of angiogenesis inhibitors are currently subjected to clinical trials while a few of them have been approved for clinical use. The drugs can be divided into several categories, including growth factor inhibitors, endothelial cell signal transduction inhibitors, inhibitors of endothelial cell proliferation, inhibitors of matrix metalloproteinases, and inhibitors of endothelial cell survival. For practical purposes, two groups can be remembered: those that inhibit a number of growth factors and those that inhibit breakdown of the basement membrane and extracellular matrix. Unlike tumor cells, tumor associated endothelial cells seem not to develop resistance to anti-angiogenic agents. Furthermore, anti-angiogenic agents are generally cytostatic rather than cytotoxic. Finally, they are considered well-tolerated. Because antiangiogenic therapy is unlikely to induce tumor regression, the criteria for efficacy must be evaluated by means other than the standard response criteria used to evaluate cytotoxic chemotherapy. Further, the redundancy of molecules responsible for the angiogenic process suggests that it is unlikely that a single antiangiogenic agent will provide prolonged inhibition of angiogenesis. Nevertheless, the understanding of the basic principles that drive tumor angiogenesis will lead to the development of therapies that will likely prolong survival without the toxicity associated with standard chemotherapy.